Plain water can be boring, and to get away from this we often turn to overly sweet drinks loaded with sugar or sugar alternatives. We know these aren’t good for our health, but many times we probably find ourselves rationalizing that it’s better than nothing. But thanks to natural vitamin water you can say goodbye to soft drinks, juice, sports drinks, and other sugary processed beverages. Vitamin water is a healthy, safe alternative that will improve your health and wellness, and help you take off and keep off excess weight.So what exactly is it? Natural vitamin water is water that has been infused with fruit, vegetables, or herbs. It’s a lot like a supercharged spa water, but made for every day use and completely affordable and healthy. 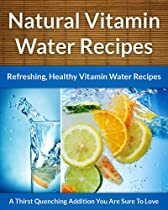 It’s finally an alternative to soda and juice!In Natural Vitamin Water Recipes, You Will Discover:- Tons of healthy, tasty natural vitamin water recipes. Each recipe includes what it does for you (energize, for example), and the nutritional facts.- Natural vitamin water’s history, and the truth about commercial vitamin waters.- How to make natural vitamin waters from scratch. When you’re done this book, not only will you be able to make the recipes in the book, but you will know how to start creating your own unique recipes.